Drawing government attention. Through citizen pushback, pressure groups or the courts. In all cases it’s an action that can change a decision-making process to address a threat. 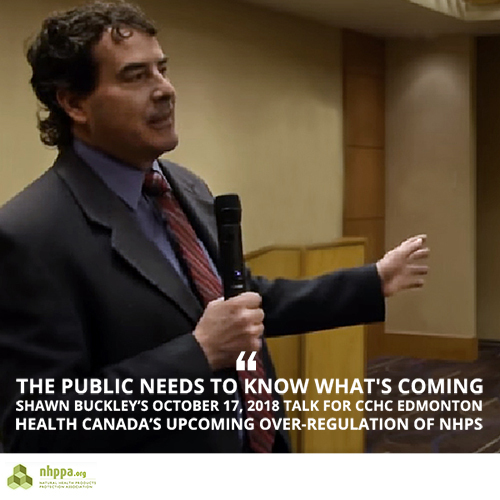 On October 17, 2018 Shawn Buckley’s recorded talk (78 minute watch), “Health Canada’s Upcoming Over-Regulation of NHPs”, for Citizens for Choice in Health Care (CCHC) in Edmonton, Alberta. Shawn shared examples of natural health product (NHP) losses when Health Canada suddenly removed NHPs from stores and made it illegal to access them. Real stories of panic and deep suffering when treatments people rely on for well-being are taken away. These experiences can become the foundation of witness testimony in court. They demonstrate that Health Canada could do more harm to people’s lives when they remove these products from the market. Natural remedies that people relied on for their health are no longer accessible in Canada. These court battles represent fighting for everyone’s rights.